Fukuda still teaches judo three times a week at her SF dojo. 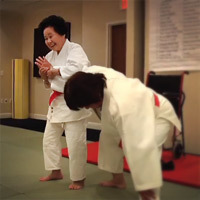 Last month, 98 year old Keiko Fukuda was awarded judo’s highest honor: the 10th degree black belt. She is only the 4th person in history, and the first woman, to reach this level. In 1934 Keiko Fukuda was preparing for marriage, like most young women in Japan. Then she met Jigoro Kano (founder of judo) and radically altered her life path. She gave up marriage, family, and her home-land to pursue her life destiny. A documentary film titled Be Strong, Be Gentle, Be Beautiful, by director Yuriko Gamo Romer, about Fukuda’s inspirational life is currently in post production and scheduled for release in early 2012. Update: There is now a Kickstarter campaign to help fund the finishing of the movie! Mark Bezos hams it up and strikes the classic hero pose as he reminds us "Don't wait to be a hero". …in both my vocation at Robin Hood and my avocation as a volunteer firefighter I am witness to acts of generosity and kindness on a monumental scale. But I’m also witness to acts of grace and courage on an individual basis. And you know what I’ve learned? They all matter. This short film from TMB Bank’s “Make THE Difference” campaign tells the inspiring true story of the founding of the Panyee FC, which is today one of the most successful youth soccer clubs in Southern Thailand. Koh Panyee is a small fishing village built on stilts and is home to around 200 families. This film is based on a true story. In 1986 a football team that lived on a little island in the south of Thailand called “Koh Panyee“. It’s a floating village in the middle of the sea that has not an inch of soil. The kids here loved to watch football but had nowhere to play or practice. But they didn’t let that stop them. They challenged the norm and have become a great inspiration for new generations on the island. Sometimes you just have to make your own platform for success!